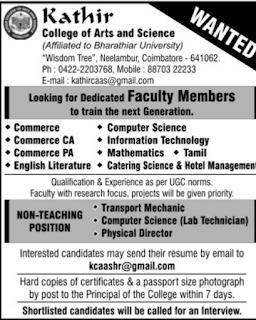 Kathir College of Arts & Science, Coimbatore has advertised in DINAMALAR newspaper for recruitment of Associate Professor / Assistant Professor jobs vacancies. Interested and eligible job aspirants are requested to apply with in 7 day s from 15th April 2018. Check out further more details below. Name of the College : Kathir College of Arts &Science , Coimbatore. About College: Kathir College of Arts and Science is located in a serene atmosphere and pollution free environment at Neelambur, Coimbatore – 641 062. It is close to the National Highway-47 from Coimbatore to Avinashi Road and Neelambur by-pass road. It is 14 km from the Coimbatore city and 3 km from Airport. Catering science & Hotel Management. 2.Looking for dedicated faculty members to train the next generation. 3.Faculty with research focus,projects will be given priority. Hard copies of certificates & a passport size photo by post to the principal of the college with in 7 days.